This assessment is to be completed after reviewing resources from Topic 10 – Exercise Instruction for Specific Groups. Students are required to address all questions in this assessment task. 1. Read the case study ( SISFFIT003 – Older Adult Fitness Programs) profile of the client below. 2. Complete Stages 1 and 2 of the Fitness Australia Pre-exercise Screening Tool to identify the risk level of the client in the case study. 3. 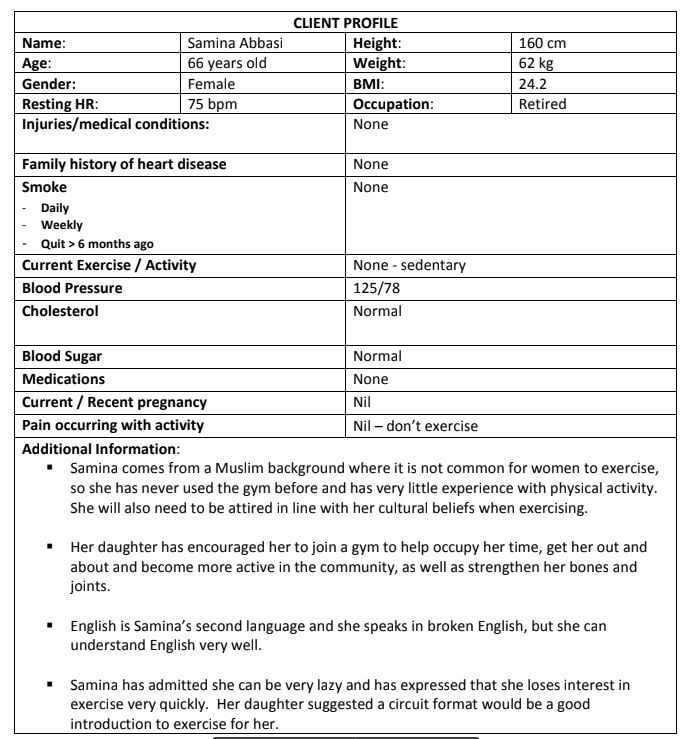 Using the program card template included in this assessment, design an appropriate circuit exercise program that Samina can complete on her own when she visits the gym. f. Use the ‘additional information’ section at the bottom of the card to list any other information relevant to the client such as injury prevention. 5. Given the cultural practices that Samina has to adhere to when exercising, what advice would you give her about how to exercise safely in a comfortable environment (eg hydration, rest periods, time of day to train)?